If you’re planning a remodeling project for a new kitchen, you’ll surely be on the lookout for ideas, tips, suggestions, and recommendations for all kinds of things, from what type of countertop to choose to what type of appliances to purchase and everything in between. Tips like that can be found all over the Internet – but what about the invaluable suggestions that are rarely considered? Where are the secret recommendations that will really make your remodeling experience enjoyable? If you’re planning a pretty extensive remodel, why not set up a temporary kitchen in your home while your actual kitchen is undergoing its transformation? Being without a functional kitchen can be an incredible challenge; save some of your old countertops and cabinets and set them up in your house in the name of functionality. You can set the space up with a hot plate, microwave, toaster oven, a small fridge, and a coffeemaker – it doesn’t need to be fancy, but it will sure make your life easier while your main kitchen is out of order. If you’re getting new cabinets and counters but plan on keeping your current appliances for now, why not leave space around those appliances so you can upgrade to larger ones later, if needed? You can install shelving between panels or use filler panels and strips in between cabinets and the fridge, for example, that all match – it looks very nice and can easily be removed later to make room, if needed. If you’ll be having new countertops and cabinets installed, do not order those countertops right off the bat! It’s best to measure the installed base cabinets to determine countertop dimensions. Don’t use the measurements on your plans because rows of cabinets can have different dimensions after they’re installed because of out-of-square walls. Order your counters after the cabinets are in. If you’ll be a bit short on counter space, you can install under-cabinet pull-down storage racks for anything from knives to spices. It’s nice to retain having instant access to your kitchen items without the clutter of knife blocks and spice racks. These racks can easily pull down for quick access then swing back up against the underside of cabinets when they aren’t needed. 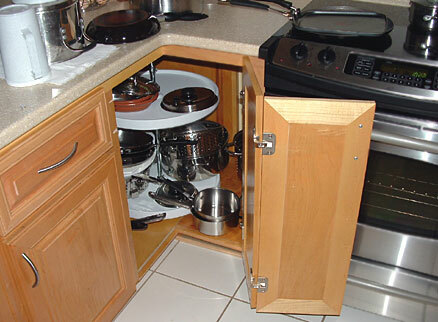 When purchasing new cabinets but keeping your current floor, you may have gaps between them once those cabinets are in. Although base cabinets are most often 24 inches deep, toe-kick depths often vary. Be sure the total width of your new cabinets is the same as those you’re replacing. If you do end up with gaps that are less than ¾” in width, you can cover them with molding. Kitchen islands are very popular, so if you’re thinking of having one added to your kitchen, you’re not alone! While they are very functional and add counter space and even sitting space in a kitchen, they can also reduce traffic flow to one-way, cramp your quarters, and limit the number of people who can work in the kitchen. Take some cheap plywood and build a full-size model so you can try out a cheap mock island before committing to a permanent one. If you find you can’t open appliance doors or it’s just too cramped, consider a kitchen trolley instead of an island. Consider your cabinets carefully – then consider them again. Those you choose are a great opportunity to add your personal style to your space and also make your cooking processes more efficient. Consider things like wine racks, lazy Susan corner cabinets, open shelving, and more when you think of kitchen cabinets. You can organize everything into a space that makes cooking fun, functional, interesting, and even artful! While there are hundreds of additional tips that can be discussed regarding kitchen remodeling, the most important tip is to take your time doing your research! Due diligence is a requirement in order to make educated decisions on everything. You’ll want to make sure you’ve considered many options for flooring, cabinetry, appliances, backsplashes, accessories, countertops, and anything else that may apply before you commit. Be sure to have everything planned out and within your budget and get that temporary kitchen up to make coffee and those little important things available during your project, and you’ll hardly know you’re missing anything until your new kitchen is complete! Byline: Written by the staff at StockCabinetExpress.com, supplier of affordable RTA cabinets online. We’ve found seven of the most ingenious tips for remodeling your kitchen in 2019 that aren’t the same old rehashed, repetitive, over-suggested tricks you see time and time again.